Also known as The Ostrich, The Prince of Wales and The Three Feathers. 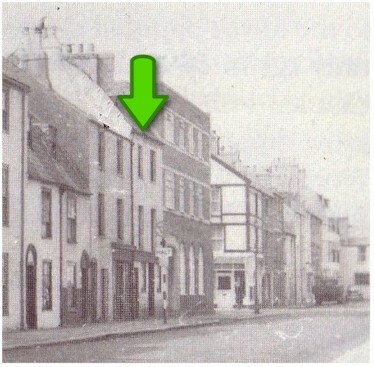 Could the picture opposite show the Feathers in Portland Road (ex Chapel Street), now Portland Market. 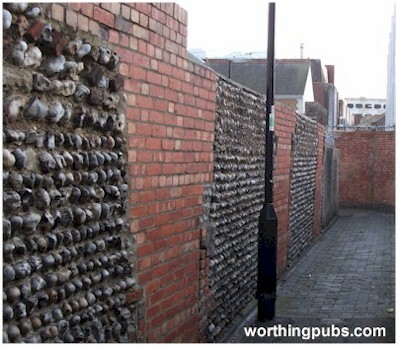 It turns out it does - see below to find out how we discovered the exact position of the pub with a little bit of detective work and an old flint wall. Closed 1926. Licence transferred to The Ham, now The Smugglers Return. The first clue was a chance discovery in the census of 1891. At 35 Chapel Street (which later became Portland Road), a Mr. Thomas Luff age 71 live with his wife Harriet 69. Just under the address are the barely discernable words ‘Feathers Inn’. Mr. Luffs profession is listed as Beerhouse Keeper. 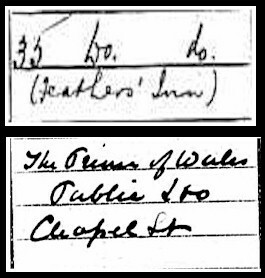 Going back to 1871, we find at 40 Chapel Street, Mr. James Rulf (hard to distinguish the exact spelling) age 34 and listed as an Inn Keeper of the Prince of Wales. 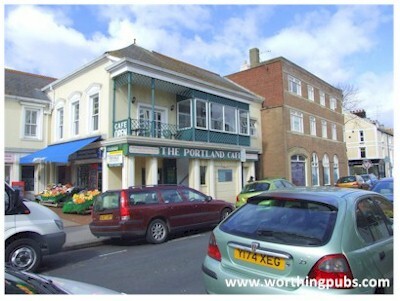 I’m quite sure it’s the same building as street numbering often changed as Worthing developed. Somehow, he managed with his mother, daughter and son to squeeze another six lodgers and a servant in to the same building. Now we have to dig around some old maps. A street map of around 1877, showed a building marked as PH almost mid way between the Spaniard in the south and the Hare & Hounds in the north - this had to be it. Comparing it to a modern map, soon revealed a discrepancy. A road, Shelley Road to be precise, cut right across it east to west. It wasn’t there in 1877 and there was the possibility the pub had been knocked down. Then I had an idea - overlay the old map on to the modern one and see if there are were points of reference that lined up . . . there were. An alleyway with a defined double bend was on both maps. It was clear that the Feathers had gone, not under the road, but instead demolished for new development, but could I pinpoint its exact position. A clue came from the layout of the alleyway itself. f it was, it would have been constructed from flint and lime mortar with evenly spaced doorways. There was only one way to find out, go and have a look. 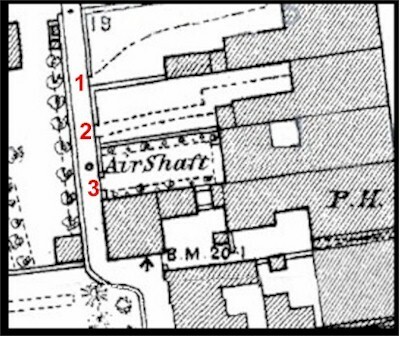 Map left, numbers 1 to 3 show the doorways off the alleyway to the yards of the adjoining properties. 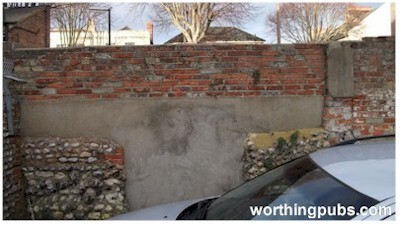 And there they are - three bricked up doorways evenly spaced just before the crook of the alleyway. We've found the back wall and with it the position of the old Feathers Inn. Left: The back (north) wall in the yard of the Feathers. There is little left of the original flint at the base, as the upper part has been rebuilt a couple of times. Not completely gone, but certainly forgotten.